The Concept Players are a small amateur theatre group based in the South East Wales area. The group was set up in order to try to put on productions that were just that little bit different. Founded in late 1994, the group had no history, and was therefore able to bring a fresh approach to the business of running an amateur musical theatre company. The group managed to get itself into the black very quickly by	putting on productions which it could take from place to place. In fact, the theory was that if the requirements were cut down to a minimum, the shows could be put on anywhere there was a space, relying solely on the group's talents as actors and singers to carry the production off. Our society is all about taking opportunities and stretching ourselves. There is no autocratic committee and everyone does more that just turn up and sing or act. We wanted to be a society that has everyone involved. Quality of singing and acting is paramount and innovation and "challenging the norm" is at the forefront of everything we do. We enjoy ourselves and take great efforts to ensure our audiences do as well. We believe in nurturing talent and avoiding the pitfalls of bad sets, bad costumes and run-of-the-mill productions. If it is worth doing, it is worth doing well! Thinking you like the sound of such a society? 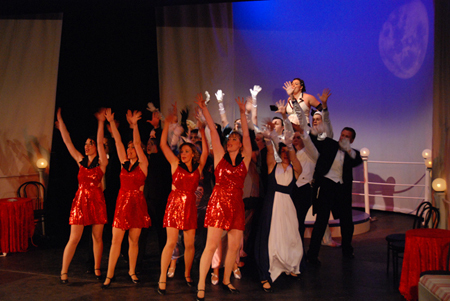 Are you an aspiring actor, a dedicated director, a top technician or a stunning singer? Or are you just not sure yet? We are a friendly group who enjoy the social side of what we do as much as the smell of the greasepaint. We can usually be found in rehearsals on Fridays which is our main rehearsal evening. We are currently rehearsing in Tongwynlais Village Hall on Friday evenings between 19:15 and 22:00. Membership is currently £10.00 a month. Even if you've never set foot on stage before but have ambitions in any area of performance or production, we would love to hear from you. It is not just singing or acting talents that are needed to put on a great production; if your interests lie in perhaps turning your hand to costumes, lights, sound, prop making, marketing, backstage - basically anything you can think of, then get in touch. You just need the guts to make the first step, after that you may never go back! Are you wondering what kind of commitment amateur theatre can be? Well it depends on what you do. If you work backstage you do not need to be at every rehearsal but in the last few weeks (and on the week of the show itself) you get more involved. If you want to help with the production, this starts many months before a live performance: publicity and costumes being two of the biggest areas. And if you want to be on stage, there will be at least one evening rehearsal for a period of up to 3 months, if you are cast in a leading role, you will have extra rehearsals. So, quite a commitment but it is great fun! Now we just need to fill it!